There are only two days left until Thanksgiving, and if you haven't produced your most memorable Thanksgiving menu yet, here are a few of our favorite holiday recipes that we wanted to share for some ideas. Jessica's sister-in-law's amazing gluten-free pie recipe which might be your new favorite go-to, especially if there are any gluten allergies in the family. My butternut squash soup recipe that has been a hit every Thanksgiving and the perfect starter to a bountiful feast. And Jessica's cranberry sauce that will no doubt trump any store bought version. It's been in their family for over 10 years and with a rustic edge, this is the sweetest accompaniment to every dish you serve. We hope you and your family have a fun, family-filled, delicious, loving, fashionable and perhaps not so fit (but that's ok) Thanksgiving! Many gluten free baking recipes rely on refined white flours, milk powders, white sugar, and other processed ingredients to provide the structure usually provided by the gluten. I personally don't use highly refined ingredients in my cooking, so after lots of research and experimenting, I've arrived at a GF pie crust recipe that is flaky and delicious while using real ingredients that you can feel good about! 2 ¾ cups of your favorite GF baking mix (I use 'Namaste Foods, Biscuits, Pie Crust and More!' Baking mix. I love the ingredients and the traceability of this Colorado based company). I use this whole food seed mixture as a binder to replace xantham or guar gums in my GF cooking. Adapted from the Gluten Free Doctor. Combine all ingredients in a small coffee grinder. Grind into a uniform powder. Using a large food processor makes this process easier, but I usually do it with a small pastry cutter. Use what you have, let the dough know who's boss, and you'll succeed! Whisk all the wet ingredients together in a small bowl and set aside. Combine all the dry ingredients together until evenly distributed. Scatter butter across flour mixture. Pulse or cut in butter until it is the size of large peas. Add half of the wet mixture and pulse or stir the dough until just combined, then repeat with the second half of the wet mixture. At this point your dough will look like wet sand at best and will just barely hold together when squeezed between your fingers. This is correct! (If it won't hold together at all at this stage, fold in 1 more tablespoon of ice water). Divide your dough into two sandy piles and form into two equal balls. It will fight, but stay calm and tell the dough that it is going to stay together and it will. Wrap your dough in plastic wrap, then place in zip lock bag. Continue to compact the dough and squeeze extra air out of the zip lock bag. Once your dough is well wrapped and in a ball shape, place in the fridge to rest at least and hour, or overnight. Remove half the dough from the fridge and allow it to soften on the counter for about 15 minutes. Press to flatten into a large disc. Roll out between two pieces of parchment paper, to about ¼ inch thick, mending the dough with your fingers if it breaks. Try to keep your dough as round as possible (this is a pie after all). Using the aid of rimless baking sheet, slip the sheet under your parchment, and then remove the top layer of parchment. Place your pie dish on top of your dough, and then swiftly invert your dough, with one hand on the baking sheet and one hand on the pie dish. Remove top parchment. Use your fingertips to gently press the dough into the dish, and to attach any extra dough to the edges. Place pie dish in the fridge. Filling! Use any pie filling you'd like, sweet or savory. My “go to” is whatever fruit is in season currently (apples and pears come to mind, or blueberries frozen during summer months) peeled if you wish, sliced, and tossed with a little GF flour, salt, honey, maple syrup or coconut sugar, any spices you like (cinnamon, nutmeg, ginger, vanilla...) and topped with a pad of butter. If you like what you're putting in it, you can't go wrong. While your bottom crust chills, prepare your filling and roll out your top dough using the above method. You can use cookie cutters or a knife to make designs on your top crust if you wish. After at least 20 minutes, fill your bottom crust with your prepared filling. To place top crust, slide crust onto rimless baking sheet and remove top parchment. 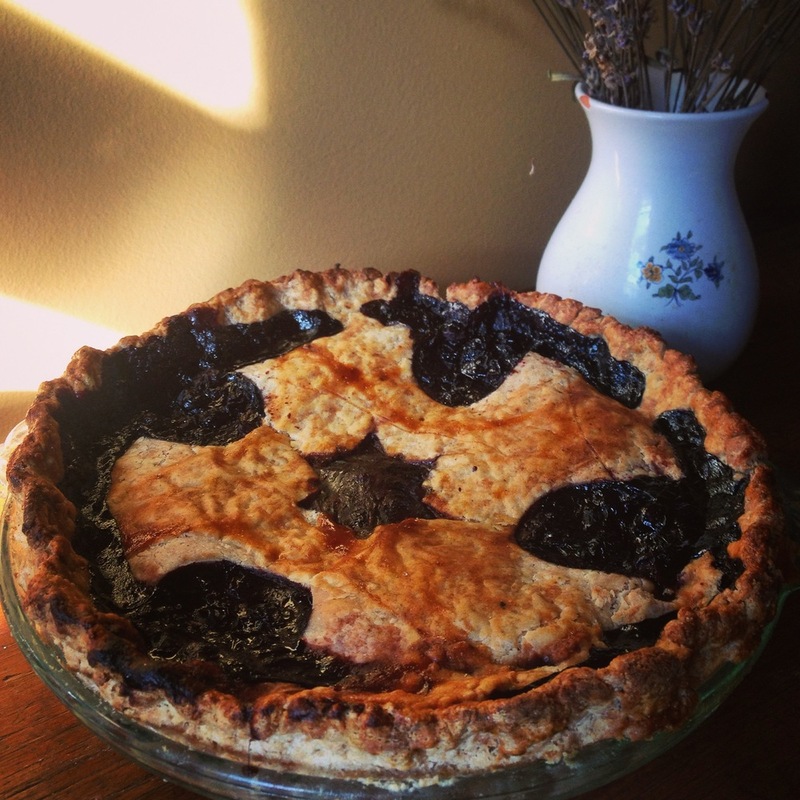 In a leap of faith, as gently as you can, invert top crust onto filled pie. This will be messy, and scary, so confidence and swift movements will help in the transition. Mend dough with your finger and attach top and bottom crusts, crimping the dough if you wish or keeping it simple for a rustic appeal. If you didn't use any cutouts in your top crust, make a few artful slits in the dough to allow for steam to escape during baking. Brush top crust with a beaten whole egg or melted butter and sprinkle with coconut sugar, if desired. At this point, you could freeze your whole raw pie, wrapped carefully in plastic wrap and foil, and bake off at another time. Or, bake at 425 for 25 minutes until the top is light golden, then reduce oven to 350 for an additional 30-40 minutes, until filling is bubbling and crust is a deep golden brown. Let pie cool on wire rack for four hours, filling your house with the wonderful smell of the holidays. Enjoy!! This soup is my all-time favorite thing to make for Thanksgiving. I've been making it for almost 10 years and it's always been a huge hit with all of my guests. This year, I'm going to attempt the gnudi to jazz it up a bit so wish me luck! What I love about this soup is that it's super easy to make, it has no cream in it like some other butternut squash soups and it's the perfect start to our abundant dinner. Enjoy! In an 8-quart stockpot, add butter and oil and melt together over med-high heat. Add the carrot and onion and cook, stirring occasionally, until the onion is soft, about 5 minutes. Stir in the garlic and cook until aromatic, about 30 seconds. Add the squash and chicken stock. Bring the mixture to a boil and add the sage. Continue to boil until the vegetables are tender, about 20 minutes. Turn the heat off and blend the mixture with a hand blender until smooth and thick. Season with salt and pepper. I like seasoning it at the end because everyone likes it different, and my kids love this soup, so I exclude any salt and pepper from their portions. Bring a large pot of salted water to a boil. In a large bowl, mix together the goat cheese, Parmigiano-Reggiano and eggs. Stir in the nutmeg, salt, pepper and flour. Form the mixture into round dumplings the size of a quarter. Dredge the formed dumplings in flour to coat, tapping off any excess flour. Working in batches, gently drop the dumplings into the boiling water, being careful not to overcrowd the pot. Let cook until all of the dumplings float to the top (cook for 4 minutes total). Remove the dumplings using a slotted spoon and set aside. Jessica and her husband Charles have been making this recipe for their family for as long as they can remember. They fell in love with it when they lived in San Francisco together more than 10 years ago, and it's still a favorite for their holiday meals. Pour the orange juice into a saucepan... that's the secret ingredient! Add 1 - 2 cups of white sugar depending how sweet or tart you want the sauce or how sweet the orange juice you select is, usually I use 2 cups. Heat this mixture and just before it comes to a boil, put about 4 cups of fresh cranberries in the juice sugar-mix and stir, reduce to medium heat or a high simmer. Be careful because when they are simmering the juice mix can rush over the sides of the small saucepan. 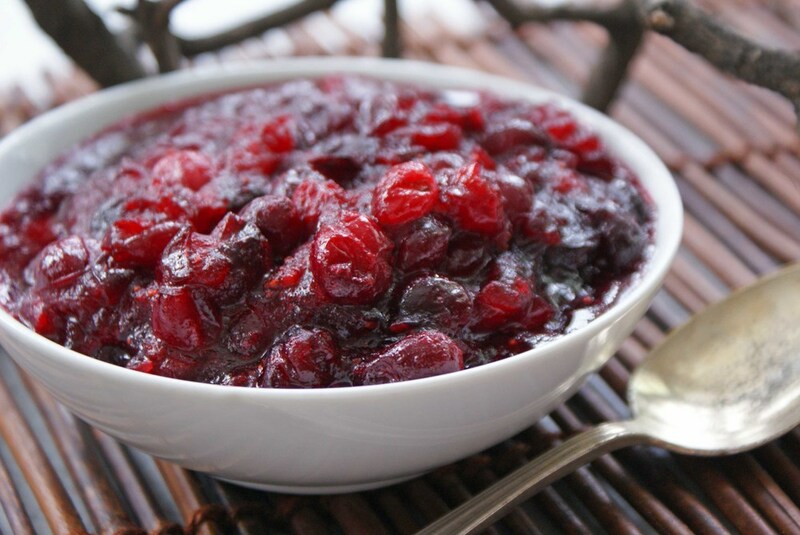 The cranberries will pop and melt down to a jelly. The longer you let them boil as a jelly, the smoother the jelly becomes. We like it a bit more rustic where you can see the berries in the sauce, so I don't continue cooking for very long after they turn to jelly. At this point, you can serve the dish hot or let it cool down. Or flare it up and throw walnut halves, pecans, some mandarin orange slices into the saucepan, or just serves as is. Try it out and see how it works for you. Brown sugar can be good as well. Enjoy! Dec 1 It Is Officially Holiday Party Season! Get Ready For It With the "Party Girl Dip"